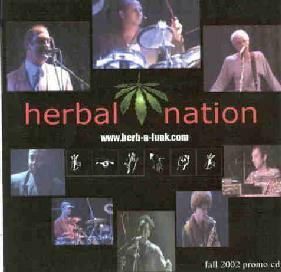 Herbal Nation are a funk band from Rhode Island. I picked up this CD at the High Times Cannabis Cup in Amsterdam. This Promo CD is a mixture of songs from the bands studio CD, live tracks and remix tracks. This is a band that is quite dedicated to Marijuana and the culture surrounding it. Take a seed, plant it, grow it, dry it, roll it, smoke it and it goes down smooth! That is the bands opening tune, "We Love The Herb". The band is vocals, bass, drums, guitar, keyboard and two excellent saxophone players (baritone and alto) and they really know how to groove. "Hi Hit" is an all instrumental jazz funk number. "Shout" is almost like a laid back hip hop type song with some nice sax but a bit boring. The next three tracks, "Testify", "Bruce Miller Pt2" and "We Love The Herb" are all live. "Testify" did not really do much for me but I did like the guitar pyrotechnics toward the end. The band really get it going though on "Bruce Miller". This is a great funky jazzy jam of a song. A great groove and jamming guitar solo at the end. The final track is a dub remix of "We Love The Herb". I look forward to hearing the bands full length studio CD and some more live. Their performance at the Cannabis Cup blew me away. For more information you can visit the Herbal Nation web site at: http://www.herb-n-funk.com.